The 20th century witnessed a revolution in the application of mathematics to biological systems. Areas such as ecology, epidemiology, genetics and physiology were quantified in radically news ways using systems of differential equations, nonlinear dynamical systems and similar mathematical structures. These systems were then analyzed mathematically, providing new biological insights. The insights were far-reaching, ranging from new explanations for complex population dynamics, to methods for controlling disease outbreaks, to formulae for much of modern quantitative genetics, to detailed understanding of complex physiological structures such as the neuron. Implications were profound. Mathematical biologists such as Hodgkin, Huxley and Ross received Nobel prizes for their scientific achievements. The flow between mathematics and biology, however, was far from one way. The biological questions, when translated into mathematical models, galvanized the development of significant new mathematical theories that were needed to solve the problems, particularly in fields such of differential equations (ordinary, partial and delay), dynamical systems, stochastic processes and statistical inference. Thus, the synergy between mathematics and biology has been crucial to the development of both fields and will continue to be for the foreseeable future. The foundational areas in mathematical biology are now well established, with defined groups of researchers moving forward on important problems. However, our understanding of biological systems has grown immensely, particularly in new directions, such as human-environment feedbacks, complex microbial systems, drug design and discovery, stochastic multi-agent systems and mutualistic interactions such as plant-pollinator systems. 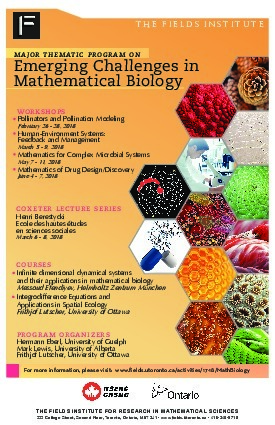 Our goal is to develop new synergies between mathematics and biology in these new biological directions by means of a Thematic Semester in Mathematical Biology at the Fields Institute. Our approach is to identify emerging challenges in mathematical biology, where recent biological developments can couple to significant new mathematical approaches. By focusing on the connection between biological questions to mathematical methods, and by engaging both biological and mathematical communities, the Thematic Semester will push the frontier of mathematical biology forward and build upon the historical successes of this approach in the past. The core component of our thematic program consists of the following four workshops. Human-Environment Systems. Sophisticated mathematical models exist to describe the dynamics of ecosystems. But understanding the feedback between multi-level jurisdictional management and regulation, human perception and behaviour towards environmental issues, and ecological dynamics requires novel tools and approaches to guarantee sustainability of ecosystem services. Complex Microbial Systems. Biofilms are ubiquitous; their presence and composition can decide over life and death. To understand their internal dynamics, we need to develop better multi-scale and hybrid models to deal with their complexity and variability. Drug Design and Discovery. The development of novel drugs is a multibillion enterprise. Computer-aided drug design, based on molecular structure and interaction, could significantly speed up the process and reduce cost. The computational challenges are huge, and novel algorithms are required. Pollinators and Pollination. A variety of causes crucially harms natural and managed pollinators and jeopardizes food security and other ecosystem services. Understanding the various ecological and evolutionary relationships in complex pollination networks requires novel mathematical approaches. Pollinators and Pollination Modeling. A variety of causes crucially harms natural and managed pollinators and jeopardizes food security and other ecosystem services. Understanding the various ecological and evolutionary relationships in complex pollination networks requires novel mathematical approaches.